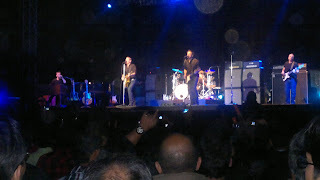 Just got back from the Bryan Adams concert here in Bangalore. Had to go and support our fellow Canadian and Vancouverite. We even wore our Canada t-shirts (but he didn't notice us). 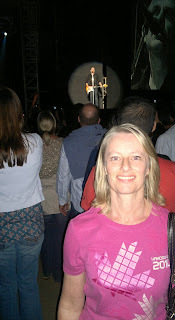 Great night, we were super close to the stage and could see him and the band really well. The highlight for me was 'Summer of 69' - everyone got into it and was loud and singing and dancing. 'Cuts Like a Knife' is apparently a ballad here in India - no one was moving or singing along - but he kept trying to get everyone into it. Played all the hits and some new tunes as well. All the songs came back to me easily, great to sing along to the hits from the 80's and 90's. We bought gold class tickets for 3500 Rp ($75). We had our driver pick up the tickets earlier in the day and then we went down at 7:00pm. Huge lineup to get in - like about a kilometer long so we just kept walking all the way up to the entrance and lucky we did because the lineup was for Silver ticket holders, 1500 Rp ($25). We got to walk right in! But I was choked when security checked my purse and told me no cosmetics were allowed in the venue - huh?? They made me throw away my lipstick and lip gloss! Can someone explain? Anyway, great evening, gold ticket holders had a huge area to stand in right by the stage and not even crowded . Silver ticket holders were behind a barrier and crammed in - not nearly as nice I'm sure. I totally loved it too!! The security check was weird, They made my nephew throw away his Hotwheels car for security reasons!!! Hmm Hotwheels and my lip gloss - wonder where all those (dangerous) confiscated items go?